If you’ve recently experienced a power outage that lasted more than a few hours, you may be upset to find that everything in your fridge has gone bad. It usually takes about four hours for a fridge’s temperature to drop to a level in which it’s unsafe to eat foods inside of it. Meats and cheeses will collect dangerous bacteria most quickly, and may be unsafe to eat even before they begin to smell. It’s very disheartening and expensive to lose all your food, especially if you’re just recently stocked up after grocery shopping. And what should you do after the power’s back on? You’ll need to clean out your fridge by purging everything and trying to get rid of any leftover smells. Here are some tips. Before doing anything else, unplug you fridge. Throw away everything that was in your fridge – everything! Only keep things that may not have needed to be refrigerated in the first place. However, if it’s been long enough, the odors of other rotten food can affect the smell and taste of everything else in close quarters. It may be your best bet to toss it all. Remove all the shelving and drawers from the fridge, and wash them thoroughly in hot, soapy water. You should also sanitize them with a solution of one tablespoon of bleach to one gallon of water. Then, wash all the inside surfaces of the fridge in the same way; first wash them with hot, soapy water, and then rinse them with the sanitizing solution. 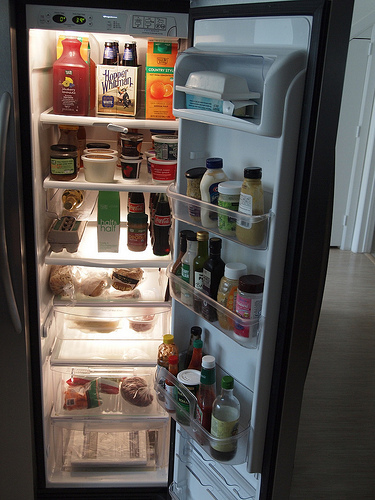 When you’re finished, you should keep the fridge door open for at least 15 minutes for ventilation. If the above thorough cleaning does not succeed in fully removing odors from the fridge, there are a few other things you can try. First, try mixing a solution of equal parts vinegar and water, and wipe down the shelves and inside of the fridge with it. At this point, leave the fridge door open for several days in order to air it out. While you’re probably eager to get it working again and replace your lost food, it’s preferable to do whatever it takes to get rid of tough odors now, or you may never be able to do it. Another method involves rolling up a bunch of newspapers and placing them inside the fridge, closing the door, and leaving them in place for several days. When you take them out, clean the fridge again with the vinegar and water mixture. The newspapers will help draw out and collect odors. Also try placing a container of baking soda or coffee grounds at the bottom of the fridge. This will also help absorb odors. Another trick is leaving a cotton swab soaked in vanilla in the fridge for 24 hours. There are commercial cleaners available at hardware stores that you can try, but this is recommended as a last resort because of the toxic nature of the chemicals. Unfortunately, if you are unable to remove strong odors from your fridge, your only option may be to buy a replacement. Gareth Shaw is a professional chef and freelance writer who loves to write when he can. He often writes about food and will cover anything from great new recipes to the advantages of having frozen food on hand.